Ice Baths Could Be Freezing Your Long Term Athletic Development? Home » Ice Baths Could Be Freezing Your Long Term Athletic Development? Recovery strategies have become an essential component of the modern athlete’s preparation for high performance sport. One such strategy which seems to have gained popularity within the GAA community in recent years is cold water immersion (CWI). CWI is typically defined in the literature at a water temperature of ≤20°C (Versey, Halson, & Dawson, 2013) and can take the form of CryoSpas, sea water dips and ice baths which can include creative basins such as converted wheelie bins or oil drums. Anecdotally, it would seem that this strategy has been adopted by managers, coaches and players due to its use with professional sporting teams and high performance athletes who primarily use this strategy to minimize symptoms of acute fatigue thus helping to speed up the recovery process (Versey et al., 2013). There are however concerns that CWI could actually be detrimental to an athlete’s long term athletic progress by inhibiting chronic adaptations to training which all parties need to be aware of prior to prescribing CWI (Leeder, Gissane, Van Someren, Gregson & Howatson, 2012). Roberts et al. (2015) investigated a range of physiological adaptations to strength training with exposure to both a cold water immersion (10 minutes at 10°C) and active recovery (10 minutes low intensity cycle ergo) strategies five minutes post exercise. In study one which was conducted over 12 weeks they reported that both strength and muscle mass gains were significantly smaller through the use of CWI compared with a control group using the active recovery strategy. Study two reported that CWI had the potential to inhibit the activation of key proteins and satellite cells for up to 48hours in skeletal muscle, perhaps due to decreased blood flow which are essential for strength and muscle mass gains. Concerns regarding the ineffectiveness of CWI to improve the rate of recovery of muscle strength post exercise have also been reported by Leeder et al. (2012) and Vieira et al. (2016) who specifically reported on isometric strength. 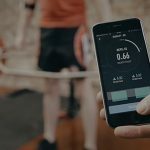 These findings could have negative implications for athletes looking to effectively increase strength and/or muscle mass particularly during a preseason general preparation phase and those athletes looking to increase their speed of recovery from injury where strength and additional contractile properties are seen as essential components to the recovery process. Before we throw the baby out with the ice bath water, it is important to note, that both muscle mass and strength significantly increased in both the CWI and active recovery groups in the Roberts et al. (2015) study, however smaller gains were seen in the CWI group as seen in figure 1. In addition, CWI has been reported in many studies to assist in acute recovery scenarios. Examples include significantly lower muscle soreness ratings (Bailey et al., 2007), facilitation of more rapid return to baseline repeated sprint performances for team sport (Ingram, Dawson, Goodman, Wallman, & Beilby, 2009) quicker countermovement jump recovery (Vieira et al., 2016), significantly better maintenance of high intensity sprint and time trial performances in cyclist (Vaile, Halson, Gill & Dawson, 2008) and improved recovery of muscle power within 24 hours post exercise (Leeder et al., 2012). This has implications for those athletes engaging in increased training loads as a route to further physiological adaptations and those team sport athletes performing repeated bouts of games/competitions close together (Leeder et al., 2012). Figure 1. Physiological responses to a 12 week strength training programme when exposed to cold water and active recovery post training. This data was reported in “Post‐exercise cold water immersion attenuates acute anabolic signalling and long‐term adaptations in muscle to strength training”. L. A. Roberts, T. Raastad, J. F. Markworth, V. C. Figueiredo, I. M., Egner, A. Shield, & J. M. Peake, 2015, The Journal of physiology, 593(18), 4285-4301. In review of the literature there would seem to be arguments for and against the use of CWI as a recovery strategy. If the priority of the athlete is to increase muscle mass, strength and/or recover from injury as quickly as possible it may be prudent to avoid CWI as a recovery strategy to prevent disrupting the chronic adaptation process required to achieve this goal, which would usually occur during the general preparation phase of preseason. However, as which occurs within GAA, soccer. rugby and many other team sports, competitive league games are recurring on a weekly basis and it may thus be prudent to adopt a CWI strategy to assist with acute recovery as the priority is performance and not strength or hypertrophy adaptations. CWI may also be a beneficial strategy for those athletes recovering from injury using a longer term or increased training load return to play protocol and where strength and/or muscle mass are not considered essential components of the recovery process. Finally, to assist those who do adopt a CWI strategy, there does not seem to be an agreed optimal CWI protocol in terms of temperature, duration and depth, however, it is suggested that effective protocols to accelerating performance recovery usually involve full body immersion to the neck, in a water temperature of 10°C – 15°C, for 5 – 15 minutes (Versey et al., 2013). Bailey, D. M., Erith, S. J., Griffin, P. J., Dowson, A., Brewer, D. S., Gant, N., & Williams, C. (2007). Influence of cold-water immersion on indices of muscle damage following prolonged intermittent shuttle running. Journal of sports sciences, 25(11), 1163-1170. Ingram, J., Dawson, B., Goodman, C., Wallman, K., & Beilby, J. (2009). 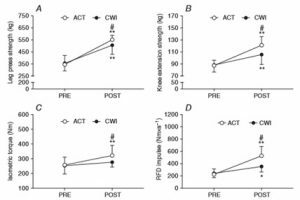 Effect of water immersion methods on post-exercise recovery from simulated team sport exercise. Journal of Science and Medicine in Sport, 12(3), 417-421. Leeder, J., Gissane, C., van Someren, K., Gregson, W., & Howatson, G. (2011). Cold water immersion and recovery from strenuous exercise: a meta-analysis. British journal of sports medicine, bjsports-2011. Roberts, L. A., Raastad, T., Markworth, J. F., Figueiredo, V. C., Egner, I. M., Shield, A., & Peake, J. M. (2015). Post‐exercise cold water immersion attenuates acute anabolic signalling and long‐term adaptations in muscle to strength training. The Journal of physiology, 593(18), 4285-4301. Vaile, J., Halson, S., Gill, N., & Dawson, B. (2008). Effect of hydrotherapy on recovery from fatigue. International journal of sports medicine, 29(07), 539-544. Versey, N. G., Halson, S. L., & Dawson, B. T. (2013). Water immersion recovery for athletes: effect on exercise performance and practical recommendations. Sports medicine, 43(11), 1101-1130. Vieira, A., Siqueira, A. F., Ferreira-Junior, J. B., do Carmo, J., Durigan, J. L. Q., Blazevich, A., & Bottaro, M. (2016). The Effect of Water Temperature during Cold-Water Immersion on Recovery from Exercise-Induced Muscle Damage. International Journal of Sports Medicine, 37(12), 937-943. The Problem Isn’t Your Lack of Focus, It’s What You Are Choosing to Focus On? I consent to Setanta Fitness collecting my details through this form.